A mad and wonderful thing? Mark Mulholland: A Mad and Wonderful Thing, Scribe Publishing, Melbourne, 2014, ISBN: 9781922070876, RRP: $29.99. Ireland, an occupied country for hundreds of years, had little success in fighting for freedom through conventional warfare but into the hearts of its people from birth was instilled a passion for freedom, that was mainly conveyed through music and poetry, and the oral retelling of tales of the exploits of our pre-Christian forebears. For example, the Thomas Davis poem above was in my youth learnt and sung enthusiastically at school by all rural children in The South. A mad and wonderful thing. From their first meeting the attraction between Johnny and Cora is fanned, and becomes love, through sharing their mutual love and knowledge of ancient Irish myths and legends, and exploring the countryside where they were set. 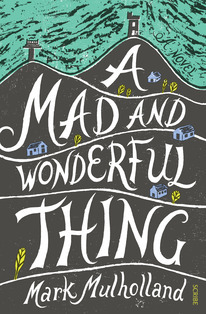 Mark Mulholland in A Mad and Wonderful Thing refreshes these inspiring memories of childhood, and uses them to build this stark, lyrical story through to its unexpected climactic finish. It is in the ancient stories of Eamonn Macha and Setanta, later to become Cuchulainn, The Hound of Ulster, and of the mythical land of Tir na n’Óg that the Irish personality took root. This land of mist and beauty, a land of brave deeds and great loves, a land of bards, songs, poetry and music seemed untouched by influences that would later overwhelm it. But this is not the days of the ‘Red Branch Knights.’ It is the late 1990s in Dundalk, a town on the border of the Republic and Northern Ireland. There is a deep dark secret that Johnny cannot share with Cora. Hundreds of years of occupation are still being played out. Britain still occupies the North, and soldiers man heavily fortified border garrisons along all roads leading South. A different war is now being waged, and Johnny is a sniper with the IRA. A family story of the activities of the B Specials fuelled Johnny’s patriotism but it was the Long Kesh hunger strikes, resulting in deaths of 10 Irishmen including Bobby Sands in the Thatcher era, that cemented his resolve to fight for his country. Johnny believes in doing everything well, and he applies himself single-mindedly to each of his undertakings. He is a brilliant marksman, mainly through his capacity for concentration and observation and relentless practice. He chooses his targets carefully and weighs up situations with great care. He is very popular with women, to whom he devotes the same attention when he is with them, but it is Cora who obsesses him. His philosophical examination of his actions lead him to his final Cuchulainn-like sacrifice, and no doubt fuelled by Cora’s asking him not to do a bad thing. I enjoyed the mythical parallel in the story between Johnny and Aisling and Diarmuid and Gráinne. For me the greatest challenge in the book is confronting the difference between the sniper fighting the enemy soldier, and indiscriminate bombing likely to target many innocent people. All war is abhorrent, and its legitimacy is debated on the grounds of whether it is taking place on home soil to defend against an invader or against a ‘foe’ so that you a nation might fortify or extend its own territory or interests. It is now 100 years since Australia went to the ‘war to end all wars’. There have been many wars since and many instances where the legitimacy of these engagements has given, and will continue to give rise to endless debate. The Border war was not popular in Ireland, especially when it came to bombings, both at home and in Britain. Women were especially appalled by the bombings. Snipers were a different matter. This is guerrilla warfare. Many families migrated to protect their sons from militancy. This was especially true in border counties. If our lives required travel to, or through, The North the Border had to be crossed. These crossings involved registration, holdups and searches that were often quite invasive, bullying behaviour, and often indiscriminate shooting. The ordeal endured by Mulholland’s father was a common experience for those of us who would venture along these roads, especially at night. My first experience with these threatening checkpoints was with my family as a small child in 1946 and my last experience was as late as 1994. A war fuelled initially by economic discrimination based on religion was likely to enlist freedom fighters whose religiously based education was peppered by tales of martyrdom for country and religion. A native of Dundalk, Mulholland’s family had their own tragic experience with the ‘Troubles’, which he confronts creatively in the book. It is small wonder that he choose to rear his own family in rural France, near Bordeaux. It was necessary to distance himself from Ireland to be able to process these events to write about them. I salute Mark Mulholland for writing this thought provoking, brave and well written book and I look forward to his next publication. It is interesting to note that this book is brought to us by Scribe, the Australian publishers. In a year when the market is overwhelmed with war related books, mainly about WW1, Mulholland’s book explores another dimension in the nature of war. Renée Leen Huish is a native of Galway city. She grew up in Donegal and Dublin. She also had family affiliations in the Dundalk area. She moved to London, where she married. They later migrated to Australia where she made a career in Education and raised a family. She maintains a strong interest in Irish history, literature and theatre. This city cailín remembers singing, Thomas Davis, ‘A Nation Once Again’ while at National School in The Republic of Ireland. (Antrim, Armagh, Down, Fermanagh, Derry and Tyrone) The other 26 counties are the Republic. Cavan, Donegal and Monaghan are in the providence of Ulster but not in ‘Northern Ireland’ they are part of the Republic of Ireland. I can only comment on my Republic of Ireland schooling. I have no experience of Northern Ireland education system. The Irish Constitution of 1937 says: “The name of the State is Éire, or, in the English language, Ireland”. Irish passports simply bear the name Ireland. Irish government regulations and official statements frequently refer to “the Republic of Ireland”. I was born after 1948, so my living and educational experience date from then. In my experience of life and the short time I spent working in England, the use of term ‘the south’ or ‘southern Ireland’ was dismissive and derogation. The English saw people from the South as terrorists, sympathisers of the IRA and ruled from Rome. I had this said to my face on many occasions in England in the late 70’s early 80’s. ‘Go back to where you came from’ was also a frequent refrain. I have no currency with the term The South.